Mix olive oil, lemon juice, salt, pepper and add to meat cubes. Keep meat cubes for 4 to 5 hours in refrigerator. Thread meat and tomatoes on skewers. Brush with marinade. Grill 3 minutes on each side, or barbecue 5 minutes on each side. 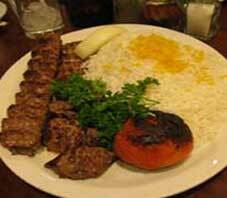 Serve hot with plain rice (Polow or Chelow) or on middle-eastern bread.